It is easy to see why this is considered the best backup camera system for RVs. The SP766M2 from Veise comes with a durable construction that can withstand the harshest conditions. It is ideal for use with large recreational vehicles, and can even be mounted on heavy equipment to provide additional safety when you are backing up. The full color display ensures that you can clearly see in any lighting, and with two cameras included with this system you never have to worry about any blind spots. It should be mentioned that the horizontal resolution is lower than the vertical which can affect image quality, but thanks to the excellent reception from the powerful antennas this backup camera is still able to display clear visuals in dim or bright light. The SP766M2 from Veise comes with two backup cameras that can be viewed separately or at the same time. This ensures that there are no blind spots, no matter the size of the vehicle. The cameras come with a waterproof construction, and the IP69K rating assures you that this backup camera system can handle almost any road or weather conditions. The cameras come with 18 infrared lights for crisp images at night, and the removable sun shade prevents bright light from distorting the pictures. With the ability to transmit images in any weather or lighting, you can confidentially reverse your larger vehicle without any worries. With the 7 inch monitor you can clearly see the images transmitted from the cameras, and the bright LCD screen ensures all of the details are crystal clear. The front placed buttons make it easy for you to navigate through the menu, and even adjust brightness and color as needed. The arrow buttons allow you to control and pan the cameras 130 degrees so you can easily see objects behind and beside the RV. You can also split the screen into two sides so you can see the images from both cameras at the same time, which can be especially helpful if you are steering a wide or tall vehicle. 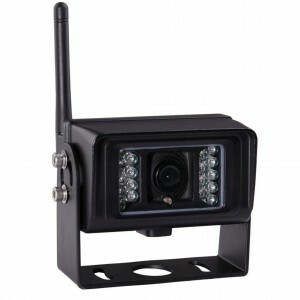 One camera can be mounted lower and the other on top so you can easily avoid any obstacles. Designed to help you and others stay safe while you are driving, this two camera backup system from Veise might be exactly what you are looking for. One of the main advantages of the SP766M2 is its versatility. Not only is it designed for use with RVs, but this camera system can also be used with cranes, excavators, and other heavy equipment. The two wireless cameras are designed to be easy to mount on the bottom or top of most vehicles, and simply connect to the vehicle’s battery with the included power cables. 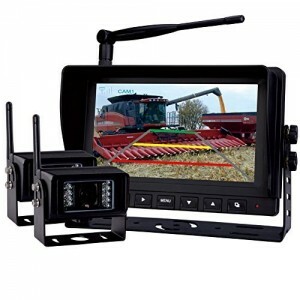 Installation is quick and easy, especially with the included mount and since everything you need comes with this rear view backup system you can get started right out of the box.